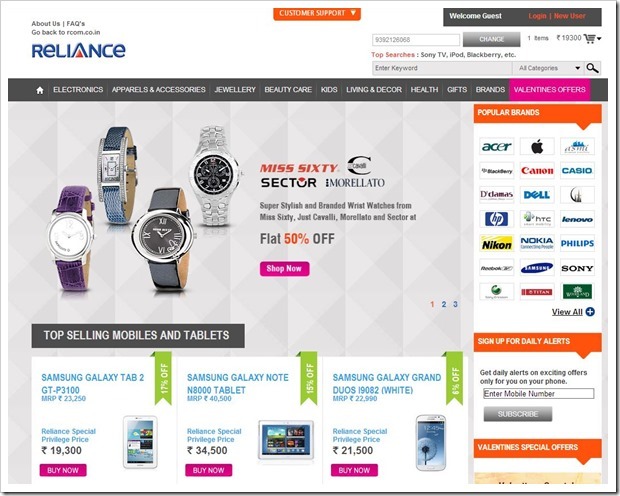 RCom launches Discounted Online Shop for its Customers! Reliance has become the latest in the long list of telecom operators & mobile brands who have launched their own online shop, but it is with a small twist. RCom has chosen to call it a “customer delight program”, where they will offering RCom customers with huge discounts on over 15,000 products in 10 different product categories. The online shop located at http://www.specialprivileges.co.in, is exclusively offered for Reliance mobile customers and to enter the site as customer has to first provide their Reliance mobile numbers. If you put mobile number of any other telecom provider, it does not allow you to go inside (obviously there is a way around to that). Like Airtel, who was first among the Indian Telecom Operators to launch a online shop, RCom’s offering is also based on the third party ecommerce platform. While Airtel utilized Infibeam’s Buildabazaar platform, RCom has chosen to go with Martjack, another popular Indian SAAS Ecommerce platform. I am not too sure the reason behind launching a “special privileges” website, if you are not even able to offer competitive pricing on the products. This could be a good channel for RCom if they are really able to give attractive prices on products to their customers, otherwise it just does not make any sense for users to buy from RCom’s website. RCom will have come up with some good discount coupons or offerings which may appeal to the users, or “special privileges” may not be too special to users. Good that you had noticed it too… but i dont guess all the products are updated after the comment is been read or may be they have not even seen it..one of my frnd was telling him that he was planning to purchase a tab which was priced very less so may be they were priced less and only a couple of products had some price error or wat so ever.. but all in all i think yes even i am happy as it will be a customer delight to see good prices on the site.